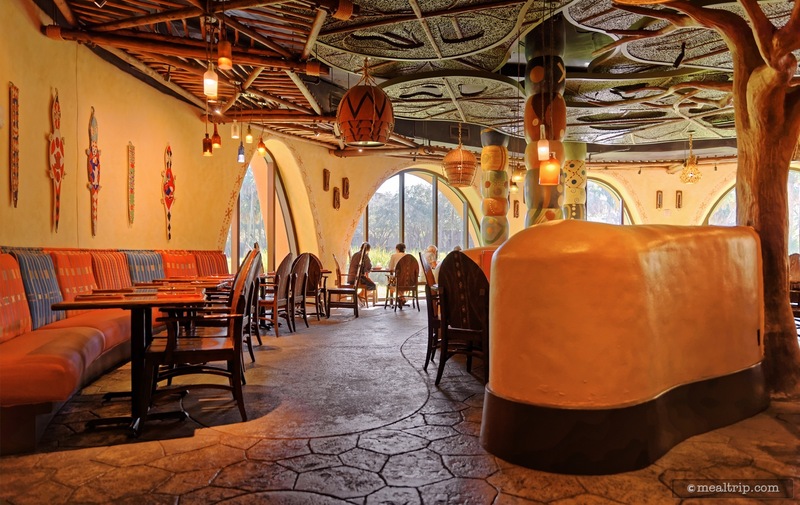 While lunch and dinner at Sanaa is a full-service/table-service meal, breakfast at the popular Animal Kingdom Resort location is one part grab-and-go counter and one part counter-service. Basically, the entire dining area is more or less available for guests that purchase items from a self-serve food table (packaged cereal and a warm oatmeal-like breakfast cereal with brown sugar and raisins, cinnamon rolls, yogurt parfaits, cut fruit and such), or order from a hot, made-to-order, quick service menu card. Those items on the quick service menu are brought out to you by the restaurant cast members, but there is no formal wait-staff type of system set up. 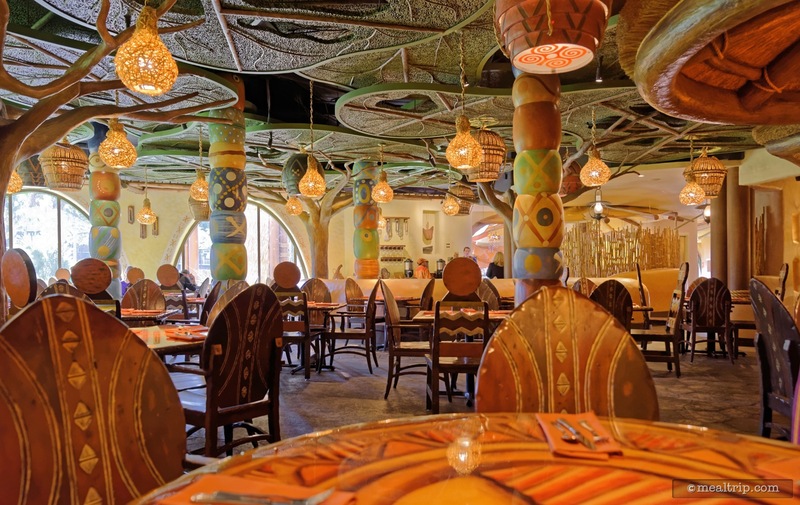 The items available fall mostly into the American cuisine category, with only small spice flourishes here and there to remind you that you're eating in an African and Indian inspired restaurant. 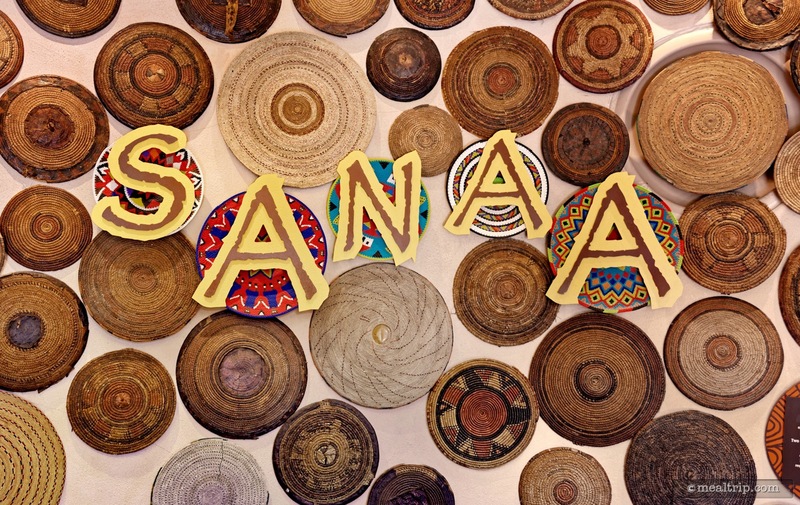 Sanaa is located on the first floor of Animal Kingdom Lodge. If you're in the lobby, you're right on top of it. Go down one flight of stairs and you'll be very close to the check-in podium. 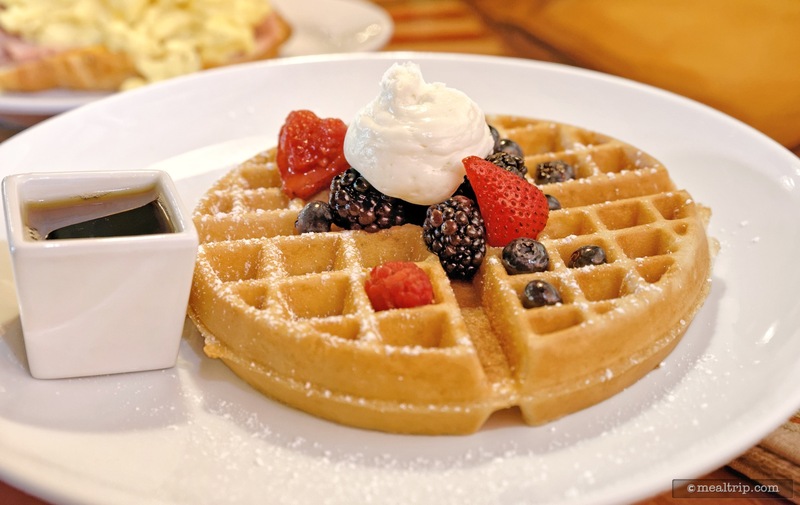 No reservations are required for breakfast. I ordered the egg croissant and very glad I did for it was the best I have ever eaten. 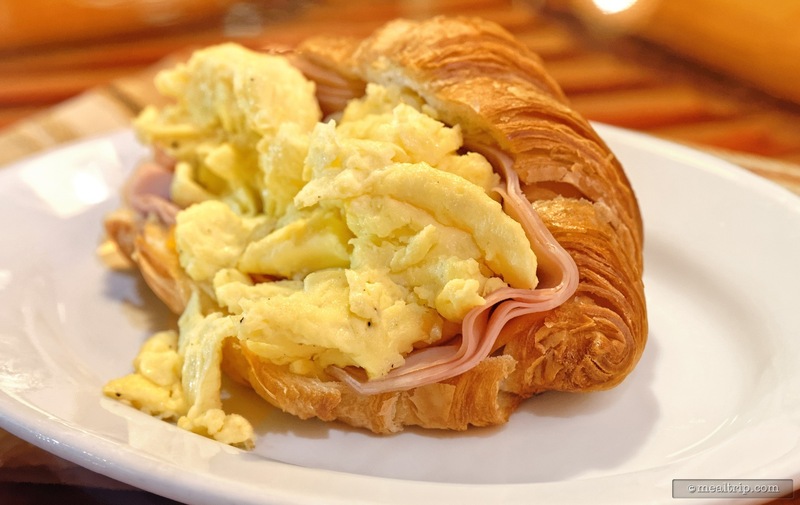 The croissant was so fresh, light and delightful to see and eat which was full of ham, cheese and the perfectly cooked scrambled egg which filled the croissant. I enjoyed every bite. It was great to be able to sit down in an air conditioned room within the restaurant with full service. The only thing that was the hold up was at the cash register. I knew exactly what I wanted and had to wait behind a customer who decided what he wanted for his entire family one item at a time. The restaurant had ample staff who could have given me the menu of choices and taken my order. I will return soon for one more very soon. 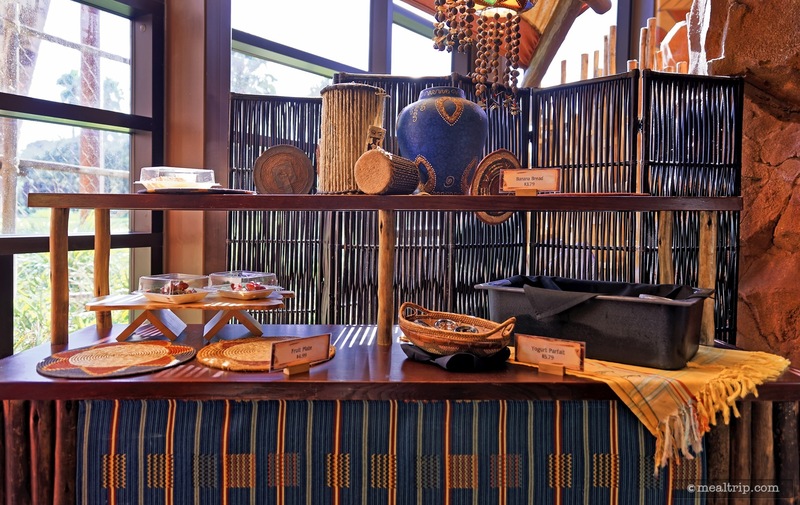 Sanaa recently introduced a brand new breakfast period that runs from 7am to 10am each day at the very popular Kidani Village resort. It's a much needed addition because for the time being, there's really only one restaurant at Kidani Village. 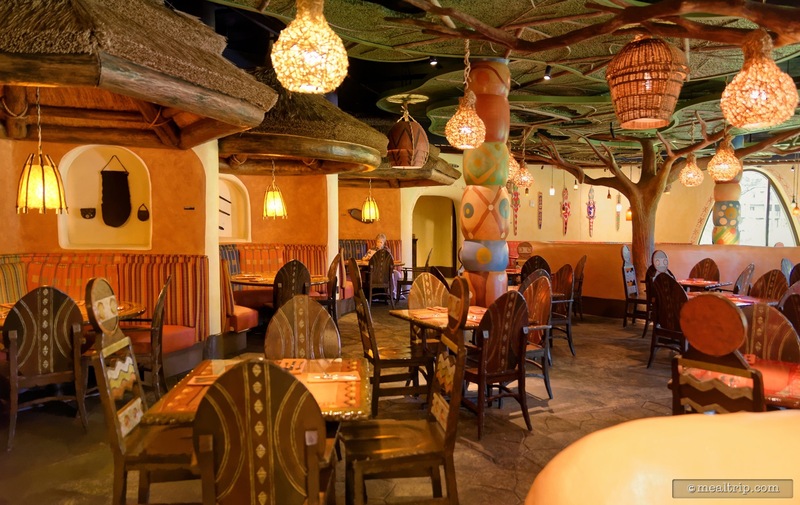 The high-end "Jiko", buffet-style "Boma", and the counter service "Mara" restaurants are all located in the Jambo House building, which is so far away from the Kidani Village, you'll probably have to take a bus or car to get there. For guests staying in Kidani Village, Sanaa's breakfast will be just a walk down the hallway. For anyone staying anywhere else, it's going to be a bit out of your way. 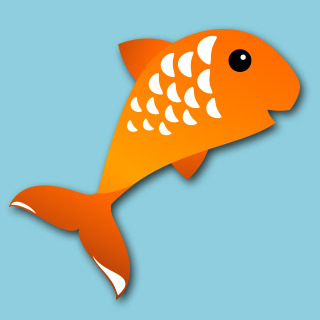 Location aside, Sanaa is a table-service restaurant at lunch and dinner. 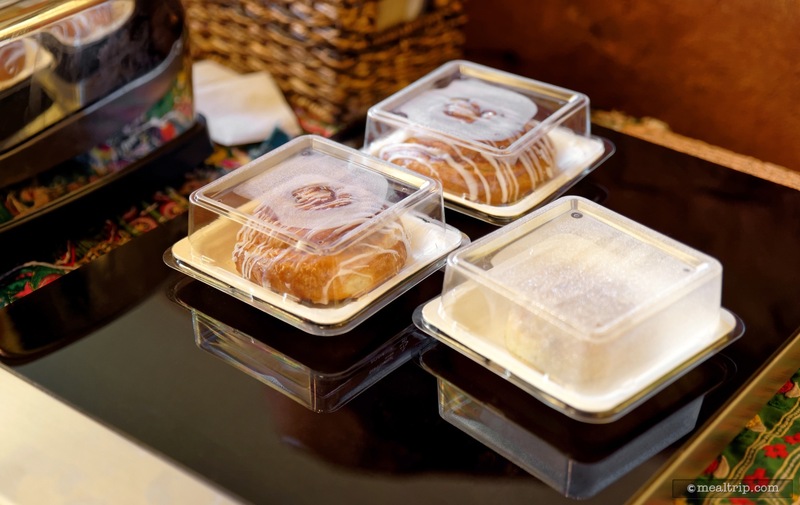 During the first two-month testing period, breakfast is going to be half grab-and-go and half "counter service" (which in itself seems to be more table-service than any other location in the Disney park system). One side-room (not the lounge, for those of you that have memorized Sanaa's layout)… is set up with a couple grab-and-go tables which seem to contain very small portions of food, all covered in plastic dishes and plates and such (i.e. so you can grab-an-go). I couldn't really see what those items looked like, the Cinnamon Rolls were all gone, and there were three or four finger-sized slices of bread basking in the sun (but not on a keep-warm tray) and well under a condensation laden plastic lid that might have been the banana bread… but I can't be sure because there was no label where the plate was. Other items in the grab-and-go area seemed really small. The "Fruit Plate" was a dozen or so grapes and six or eight slices of apples and melons and such on a foam plate with a plastic cover over it. The "Yogurt Parfait" seemed to be two small plastic cups, one containing white yogurt (kept in an ice bath) and the other containing dried granola looking bits… I suppose this one is more of a grab-and-go-and-mix-it-your-self offerings. Well, not wanting to hide my feelings here much deeper in the article… I would actually rather just see most of these things (like the Cinnamon Rolls and the Banana Bread) plated like the other counter-service options. Hey, if they're good... serve them up right. Leave the packaged cereal and whole bananas and apples on the grab-and-go counter, and let that be that. Moving on to the "counter service" options, a small laminated menu is available at what would be the "front check-in counter" of Sanaa. Reservations are not needed for breakfast so there's really no need to check-in. You'll be directed to the grab and go area with your plastic menu and a single register. If you're not into any of the grab-and-go items, you can just walk over to the register and purchase whatever you would like off the laminated menu card. Upon payment, you'll be give a very small wild animal with a number hot-glued to it's side. 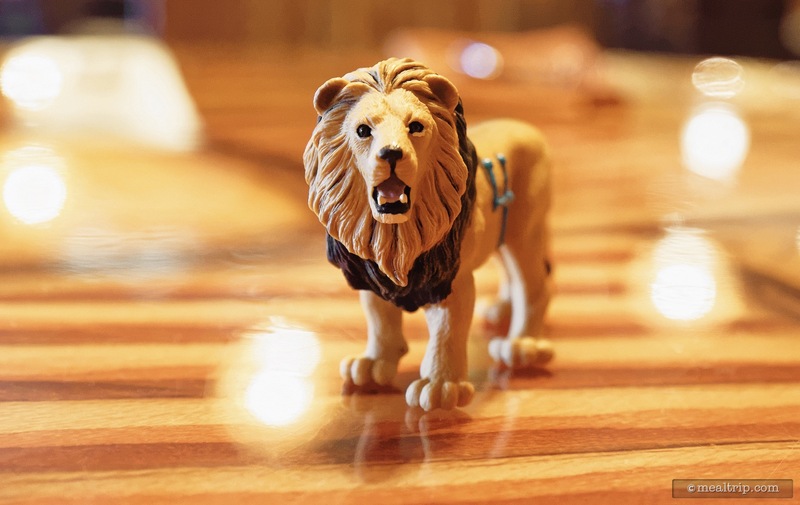 Fortunately, these small animals are plastic and are being used in this case, as table numbers. 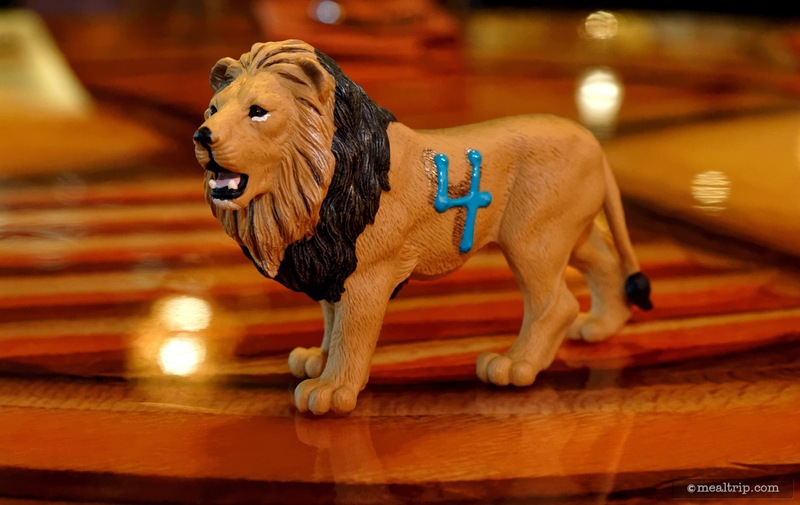 After you've sat down (pretty much anywhere you want in the restaurant) just put the numbered animal on the table, and your hot food will be delivered to you… on an actual ceramic plate, with actual metal flatware, by a real live person that looks an awful lot like a waiter or waitress. Now… considering you're paying counter service prices… this is a huge deal. It's soooooooooo nice not to see a paper Disney plate for a change, and to eat with a real fork! For me, this is worth the trip to Sanaa's "counter service" breakfast alone. 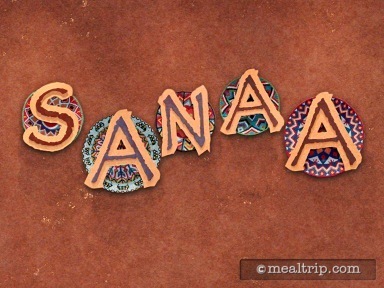 The items on the "trial" breakfast menu are not as "African infused" as the lunch or dinner items at Sanaa, and tend to be more "western standard" but with a single flourish of African insertion tossed in the mix somewhere. But… you have to keep in mind… this is "counter service". 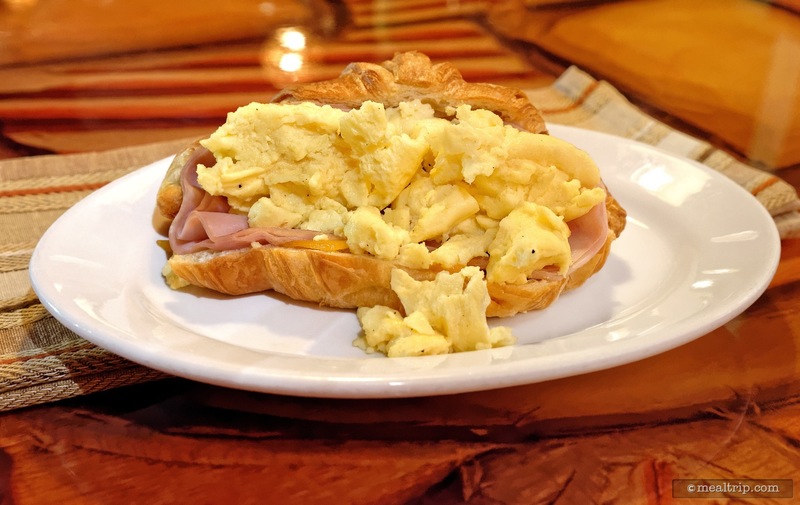 Just a few days after starting the new meal period I sampled the "Sunrise Sandwich" which is made with one Farm Fresh Egg (a very large egg, to be sure), sliced ham, cheddar cheese and served on an amazing looking warm Croissant, that would give Epcot's Les Halles Patisserie a run for it's money. The sandwich (while not being particularly African) was quite honestly, one of the lightest, freshest, and most flavorful "counter service" items that I've ever eaten on Disney property. It would totally be on-par with any table-service breakfast item at any other location. Also sampled was the "Safari Waffle" which is a large Belgium-style waffle, dusted with powdered sugar, topped with seasonal berries and some pretty tasty Chai Whipped Cream. The Safari waffle is delivered with a small dish of maple syrup, which I tried a bit of... but it wasn't really necessary. 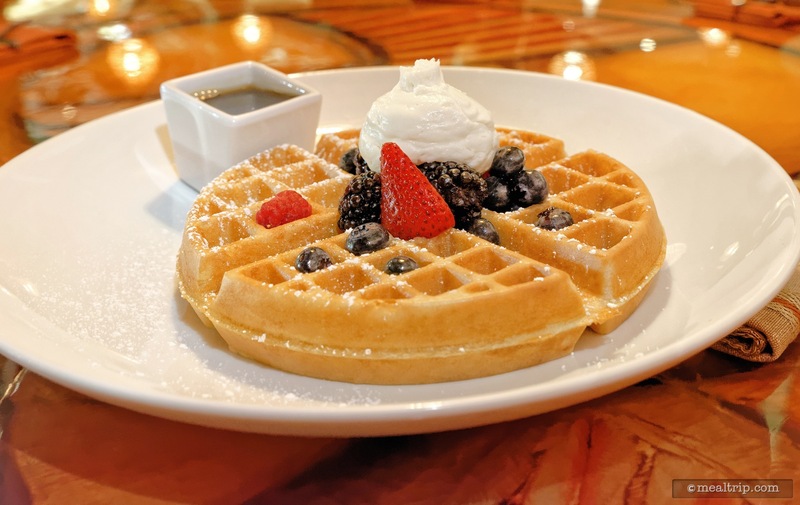 The light waffle, macerated berries and delicate chai cream seemed to get heavier with the syrup… so, if that's the way you like your waffles, the option is there. Here again, there's nothing that really says "African breakfast" with the exception of the Chai Whipped Cream… but that Chai Whipped Cream was really good… did I mention that already? 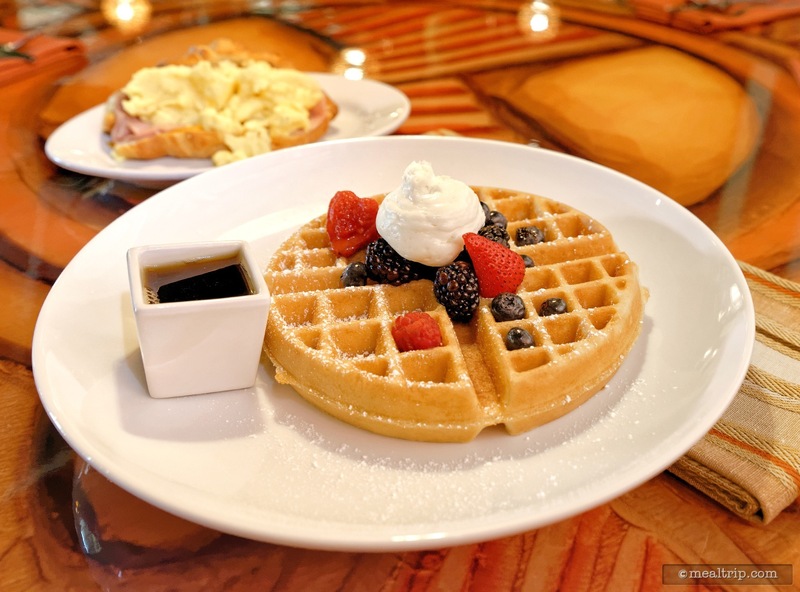 You'll actually be pretty hard-pressed to find anything other than a standard American breakfast at any of the Disney property locations so it can't really be a "disappointment" per-say. Being a foodie though, I do wish there were one or two items on the menu that were even more African-spiced. All in all, it was a great breakfast and definitely one of the best "counter service" breakfasts that I've had on-property. It is worth noting that the beverages here, all seem to be of the "in a plastic bottle with a twisty lid" variety unless you're opting for hot tea or coffee, in which case you'll be given a small styrofoam cup and directed to the self-serve dispensers. From an environment point of view, it's also worth mentioning that there are not really any animals on the "savanna" at that time of day (there are giant floor-to-ceiling windows on one side of the restaurant that offer a sweeping view of the animal paddocks just outside). There seem to be a few large birds from 7am to 10am, and maybe a cow… but nothing too exotic. How would I make it better? Ditch the grab-and-go idea completely and offer one or two entrees that are more African inspired. 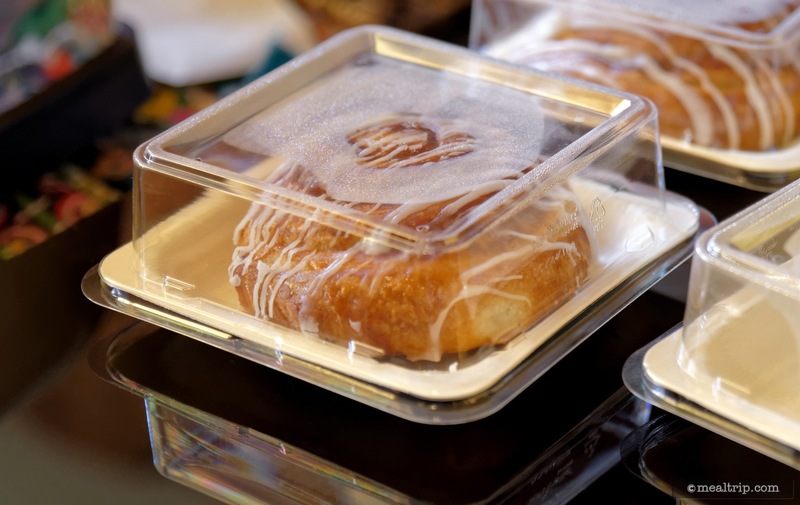 I saw a sad little circle of Bobotie (an African themed egg pie with sausage) drying out on the keep-warm grab-and-go counter… offer that with the Ceylon Cinnamon Roll on a ceramic plate for $7.99 (which is more than what the two items cost individual on the grab-and-go counter) and call it a day. What remains to be seen though, is if there's enough business at Kidani Village to warrant a breakfast period at all. Maybe guests staying in the Jambo House side of the complex will make their way over to Sanaa for breakfast, but I don't see too many guests being bussed in from (for example) the Bay Lake Resorts, when there's just so many other options available closer to them. It's too bad really, because this was one of the best tasting and fairly priced breakfast's that I have had on property... in a very, very long time. As I mentioned, this breakfast is in a two-month testing period so it should be available until around Thanksgiving of 2016. If successful, it will continue on after that indefinitely. I really hope that's the case, as it might even one day… (fingers crossed), lead to a Sunday Brunch... where the top-notch culinary team at Sanaa will really get a change to show off their culinary breakfast skills.